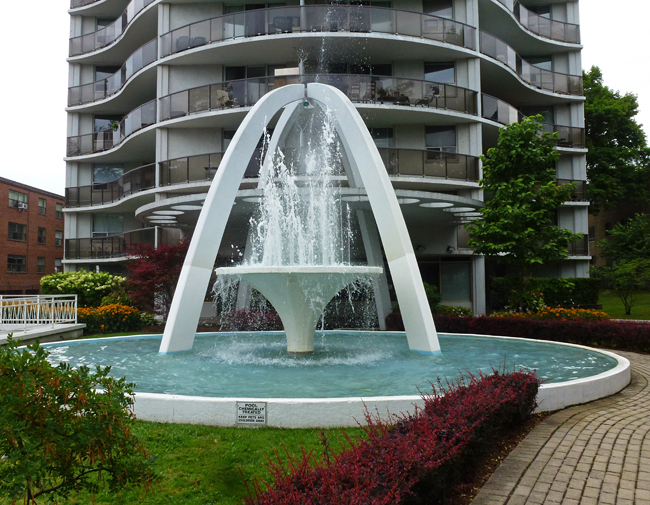 This fountain is found in front of an apartment building in the Annex neighbourhood and it is always nice to see it running each year. The building and fountain were designed by architect Uno Prii who is a favourite - click on the label below to see more of his apartments. It has been a few years since I showed this fountain so it was time for another look! That sign probably says "NO SWIMMING"
Hello, it is a pretty design. I love fountains. Happy weekend to you! I clicked on the link to see them all and I LOVE them. His style is very modern with a mid-century futuristic twist to them. I think I could live in this one and enjoy it very much. I also like the very first one you posted way back in 2010. That sort of lip in the front is very unique. It's a St. Louis Arch miniature. Lovely building and fountain. The fountain is both modern and classic. Fine combination. Have a great weekend, RedPat. That is a neat one. Very pretty! I love the balconies on the apartment building! A pleasant sight on our HOT summer days. Love his style, it's a great design. Wow, that is some fountain and there's that cool designed building again too! Fountain's attractive shape sets off the water's action.